HUD Secretary Ben Carson and his wife, Candy, walk on stage before addressing agency employees on March 6, 2017, in Washington, DC. WASHINGTON (CNN) - The former chief administrative officer for the Department of Housing and Urban Development says she was demoted in part for refusing to spend more than was legally allowed to redecorate Secretary Ben Carson's new office. In a November 2017 complaint obtained by CNN, Helen Foster said she was told to "find money" beyond the legal $5,000 limit for redecorating. In one instance, she says a supervisor said that "$5,000 will not even buy a decent chair." Foster's sworn complaint with the Office of Special Counsel, the independent agency charged with investigating whistleblower complaints made by government employees, says that after she refused to misuse taxpayer dollars for the office redecoration project she was "retaliated against by being taken out of my position as Chief Administrative Officer." She says that HUD's Acting Secretary Craig Clemmensen pulled her aside more than a month before Carson's March confirmation and told her that Carson's wife, Candy, wanted to "help the Secretary redecorate his office suite." Clemmensen asked Foster to assist with "getting Mrs. Carson access and funds for the project," the complaint states. Foster said she told Clemmensen that legally, the department was limited in how much it could spend on the office redecorating project to $5,000, information she says she also passed along to the administrative officer in the Secretary's office. But even so, Foster said she received repeated pressure in multiple conversations to "find money" for the redecorating project in excess of what was legally allowed, including in a one-on-one meeting on February 10. Clemmensen, according to the complaint, told Foster that the administration "has always found money for this in the past." In an exclusive interview with CNN, Foster said each time Clemmensen pushed her to assist Carson's wife with finding the money, it was always "in the context of Mrs. Carson wants to do this. We have to find the money." "There was a sense of 'we are not going to take no for an answer.' There was a lot of staff time spent on this," a former HUD employee with knowledge of the situation told CNN. "The most frustrating part of all this was spending so much time on this issue," the former employee said. "Instead of focusing on HUD's mission, we were talking about furniture for the Secretary's office. A HUD official disputed Foster's account. "When it comes to decorating the Secretary's office, the only money HUD spent was $3,200 to put up new blinds in his office and the Deputy Secretary's office, "HUD spokesman Raffi Williams told CNN. "The Secretary's Administrative officer is aware of the limit and ensured that the limit was not exceeded." HUD provided receipts to CNN that total $3,373. Neither Candy Carson nor Clemmensen responded to a request for comment. The latest allegations come as Carson is facing scrutiny for the role that his family has played in his department, after reports that his son, Ben Carson, Jr., organized an official listening tour in Baltimore last year against the advice of department lawyers that the move risked violating federal ethics rules. Carson has called on HUD's inspector general to review the issue. The IG's office calls it an "open matter." Carson has said that his family is "under attack" and that he wants to "put to rest these unfounded biases." Foster said she was so frustrated and concerned about the pressure she was under that she reached out to Sarah Lyberg, HUD's acting assistant chief financial officer for budget, on February 13. In the email which has been reviewed by CNN, she wrote that she had been asked about "finding additional money." "Is there any way Admin could appropriately spend additional funds over $5000 to provide new furnishings or decorating for the Secretary's Office without getting appropriations approval," Foster asked Lyberg in the email. Lyberg responded: "We cannot exceed the cap." Further evidence that the issue continued to be a topic for discussion came on February 22, when the office of HUD's Chief Financial Officer sent a memo to Clemmensen and Janet Golrick, the department's acting deputy secretary, detailing the rules surrounding funds for decorating Carson's office. The memo, which was obtained by CNN, said that spending of more than $5,000 "requires advance notice to the House and Senate Committees on Appropriations." If the department failed to give that notice, it would violate the Antideficiency Act, which bars federal agencies from spending federal money before it has been appropriated by Congress. On February 1, Foster received an email from Kenneth Free, the special agent in charge of HUD's protective services division, following up on a conversation that they'd had in person. In the message reviewed by CNN, Free was providing more information about a request to purchase a security system for Carson's Vienna, Virginia, home and pay for it using government funds. Carson's new home, Free wrote, "is a single family home with no fence and backed up to a wooded area" and had many doors and windows that someone could force their way into. "To ensure the security of the Secretary, we are recommending an alarm system be installed to enhance the security of the Secretary," he added, noting that other agencies pay for alarm systems for their secretaries. Days later, Foster reached out to Lyberg and Michael Moran at HUD via email with questions about the request and whether or not it was appropriate for the department to foot the bill. "DO WE PAY to have security systems installed at the Secretary's residences? Are we allowed to do so? Should we be doing so," she wrote. The February 22 memo that included details about the redecorating request also mentioned the guidelines surrounding the security system funding. The memo said that, "as a general rule, appropriated funds are not available for the personal expenses of government employees, including agency heads." However, the memo stated that funds could be made available for security for a government official "who has been threatened or is otherwise in danger" if the agency determines "that the risk impairs the official's ability to carry out his or her duties and hence adversely affects the efficient functioning of the agency." Foster says on March 6, her superiors instructed her to write a memo justifying the purchase of a security system for Carson's home, and instructed her to make sure that she addressed the items in the February memo needed to justify the use of HUD funds. CNN asked HUD about the alleged request, but the agency did not respond to this line of questioning. Foster said that she spoke with the head of Carson's security detail about threats that he was facing. "The only thing he could tell me is that they were concerned because The Washington Post ran a spread that had photos of the Secretary's Vienna home," Foster said. Foster told CNN she refused to write the memo because she didn't think it was justified. A source with knowledge of Carson's threat assessment in the months leading up to his confirmation told CNN that "the threat assessment for Carson was low." HUD spokesman Williams disagreed. "Carson is one of the most recognizable cabinet members and was a former candidate for President," Williams said. "Our career security detail deemed an alarm necessary based after reviewing the threat assessment for Secretary Carson." Asked about threats that Carson has received since becoming HUD secretary last year, Williams said, "for security reasons, we don't comment on the details of his security." Carson paid for the security system out of his own pocket, HUD said. In August 2017, after the events in Charlottesville, Virginia, Carson said that his home was vandalized. "More recently our home in Virginia along with that of a neighbor was vandalized by people who also wrote hateful rhetoric about President Trump. We were out of town, but other kind, embarrassed neighbors cleaned up most of the mess before we returned," Carson wrote in a Facebook post. In the months following, Foster saw her stock at HUD fall. She said it was retaliation for her refusal to write the memo justifying spending money on an alarm system for Carson and her refusal to "find money" for Carson's office redecoration. In the complaint, Foster also says she was retaliated against for pushing for her superiors to report a $10 million budget shortfall at HUD dating back to 2016 under the Obama administration. Foster says the "agency leadership was unwilling to report the $10.8 million funding deficit to the appropriations staff." HUD did not immediately respond to a request for comment on this allegation. 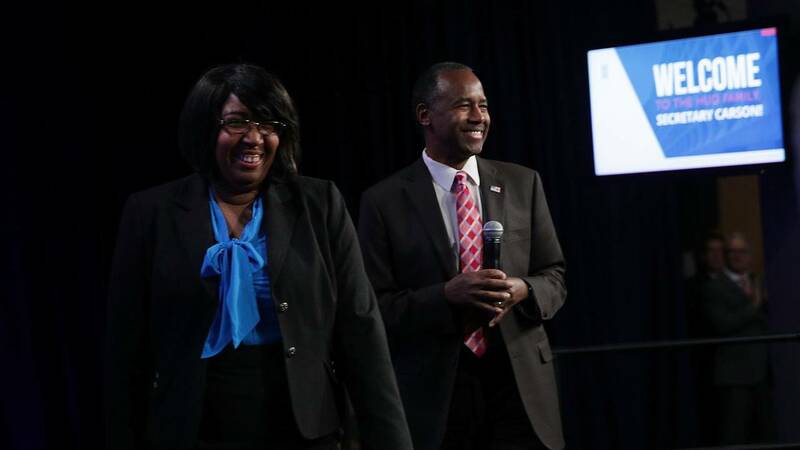 On March 22, 2017, just 20 days into Carson's tenure at HUD, Foster received a perfect score on an employee review, her second outstanding score in the course of three months. Just four months later, she said was demoted and reassigned to oversee privacy and FOIA requests. "I was put into a job that was made up, something in the federal government we call the 'rubber room,' and then I protested and asked to be put on detail until I could find another job," she told CNN. Foster said that she wasn't given a substantive reason, but that, based on her positive performance reviews, she can only conclude she was removed because she didn't "find a way" to approve more money for the office project than was allowed by law. Williams, the HUD spokesperson, told CNN that it's not unusual for Senior Executive Service employees to be rotated and that, in fact, the Office of Personnel Management, encourages it. "The annual government-wide goal beginning in FY 2017 is to have 15% of Senior Executive Service members in rotation," the spokesperson said. "That's bogus," Foster responded. "I had only been at the agency for seven months and you're already rotating me out of the role? That makes no sense." The former HUD staffer told CNN that the fact that Foster, who joined HUD in July 2016, was brought in by a political appointee within the Obama administration hurt her standing with the new administration. "I think Carson's folks saw her as a political rather than a career employee," the former HUD aide said. "There were some personality clashes as well." Foster though pointed back to her performance reviews. "All of my references going all the way back to (her time at Federal Trade Commission) would say the same. Blunt but effective," she said. "Look at my performance evaluation from 2016. You will note it doesn't say I was too adversarial. It says I got things done." Foster, who is still a HUD employee, though detailed to another agency, told CNN that she was contacted by the Office of Special Counsel (this office is unrelated to Justice Department special counsel Robert Muller) for an interview last week. The office has 120 days to decide whether it will launch an official investigation. If the OSC finds wrongdoing, it can pursue disciplinary actions against the agency, arbitrate the situation and it could also seek relief on Foster's behalf -- including getting her previous job back. OSC spokeswoman Jill Gerber told CNN that the office "can't comment on or confirm any pending cases." Foster, who is a mother of two, said that what happened at HUD has made it hard for her to find work. "With such a short tenure, I am unable to qualify for comparable positions in the private sector," she said, adding that the only government jobs she's qualified for in the last four months have "been at the Deputy Program Director level -- at least three levels below my former status." At least twice, Foster said, prospective employers have asked her: "What happened at HUD?"